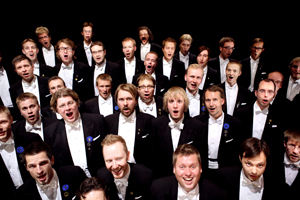 The YL Male Voice Choir is a pioneer in Finnish choral music. Founded at the University of Helsinki in 1883, it is the oldest Finnish-language choir in Finland. Its cultural merits, extensive history of concerts, several tours abroad and numerous critically acclaimed recordings have established it as one of the world’s most prominent male voice choirs. Ever since its founding, YL has pursued a policy of commissioning, performing and recording both Finnish and foreign choral music. Most of the major works of Jean Sibelius for male voice choir were commissioned and premiered by YL. Today, the choir is recognized as the leading performing authority on Sibelius and also as a champion of contemporary music. Many contemporary composers, among them Einojuhani Rautavaara, have dedicated works to YL. YL regularly gives concerts all around Finland and also exports Finnish music to Europe, America and Asia. In addition to its extensive and diverse a cappella repertoire, YL performs choral works with major international orchestras and conductors. Many well-known soloists in both the classical and popular genres have made guest appearances in YL concerts and on YL recordings. The YL Christmas concerts are a well-established tradition with the choir and audiences alike; every year, they bring some 12,000 listeners to the churches of Helsinki. The choir's Christmas disc featuring Soile Isokoski (Jouluyö, juhlayö) went gold, selling more than 15,000 copies in December 2006 (ODE 1088-2). In 2010, YL appointed Pasi Hyökki as its new conductor. He succeeded Matti Hyökki who had led the choir during 20 years, with many awards along the way.